Last night, a digital remaster of the first Pokémon episode debuted on Japanese television. The episode originally aired on April 1, 1997. The episode has been remastered before. Below you can see how the 2012 remastered version compares with a 2014 Kids Station re-airing of the original. That remaster celebrated Pokémon’s 15th anniversary. 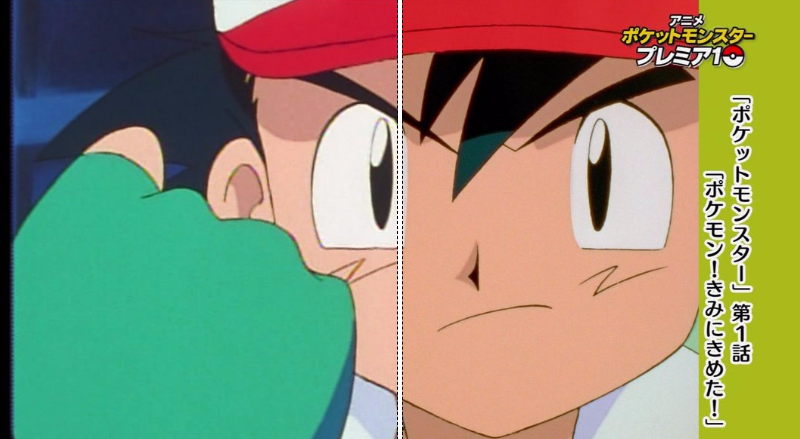 In the latest digital remaster, marking Pokémon’s 20th anniversary, the credit sequence was also cleaned up. Here is the same still from all three different versions. The original version has the Kids Station watermark. The 2012 remaster has gray-black bars with star twinkles, while the latest remaster has greenish-yellow bars on the sides. It looks like the latest remaster evens out the flesh tones. The clip below compares all three versions. On the right is footage from a Kids Station re-run of the original episode. On the left, you can see the 2012 remaster with the gray-black bars and the latest remaster with the greenish-yellow ones. The first episode isn’t the only one getting an HD remaster. According to the latest Pokémon movie’s official site, there will be a total of ten episodes getting the HD treatment as part of a “Premium 10" weekly broadcast. Pokémon-loving Japanese celebrities will pick their favorite and most memorable episodes. The first one, however, was selected by longtime Pokémon anime director Kunihiko Yuyama.